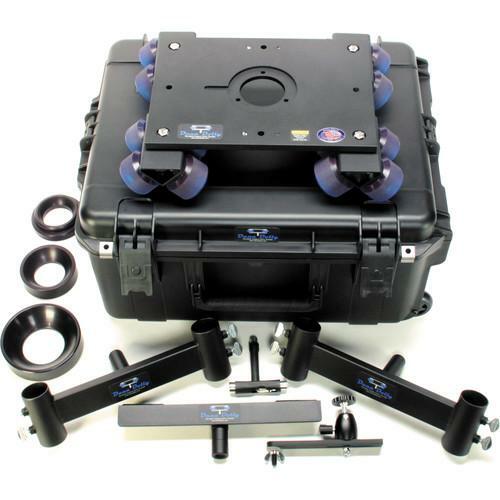 We recommend checking out our discussion threads on the Dana Dolly Portable Dolly System Rental Kit with Original DDORK1, which address similar problems with connecting and setting up Cine Dollies & Track Systems Dana Dolly. The user manual for the Dana Dolly Portable Dolly System Rental Kit with Original DDORK1 provides necessary instructions for the proper use of the product Professional Video - Tripods, Supports & Rigs - Cine Dollies & Track Systems. The Dana Dolly Portable Dolly System Rental Kit with original style track ends is a heavy duty camera dolly platform that rides on 16 custom modified soft polyurethane wheels that resist flat spotting and use ABEC-7 rated precision bearings providing you with extremely smooth dolly shots. This kit is complete with 75, 100, and 150mm bowl adapters, and comes in a custom flight case. The wheel trucks swivel, allowing the dolly to ride on available straight or curved track, which you must source separately. The manufacturer recommends using standard speed rail or Schedule 80 aluminum pipe of compatible size. The dolly includes two original style track ends, which accept inch and a quarter pipe (standard speed rail), and fit into available standard Junior stand receivers. A center support is included for long track runs or when using heavy cameras. The dolly platform is machined from aluminum and features a standard Mitchell mount including a 2.75" center hole with a machined key way. The platform incorporates one 3/8" through hole, one 1/4"-20 threaded hole, and one 3/8"-16 threaded hole on each side of the dolly platform for a total of 6 accessory mounting holes. The rental kit includes a monitor mount with a ball head adapter. The Dana dolly is designed and manufactured in the USA. If you own a Dana Dolly cine dollies & track systems and have a user manual in electronic form, you can upload it to this website using the link on the right side of the screen. Box Dimensions (LxWxH) 25.25 x 20.25 x 13.0"
The user manual for the Dana Dolly Portable Dolly System Rental Kit with Original DDORK1 can be downloaded in .pdf format if it did not come with your new cine dollies & track systems, although the seller is required to supply one. It is also quite common that customers throw out the user manual with the box, or put the CD away somewhere and then can’t find it. That’s why we and other Dana Dolly users keep a unique electronic library for Dana Dolly cine dollies & track systemss, where you can use our link to download the user manual for the Dana Dolly Portable Dolly System Rental Kit with Original DDORK1. The user manual lists all of the functions of the Dana Dolly Portable Dolly System Rental Kit with Original DDORK1, all the basic and advanced features and tells you how to use the cine dollies & track systems. The manual also provides troubleshooting for common problems. Even greater detail is provided by the service manual, which is not typically shipped with the product, but which can often be downloaded from Dana Dolly service. If you want to help expand our database, you can upload a link to this website to download a user manual or service manual, ideally in .pdf format. These pages are created by you – users of the Dana Dolly Portable Dolly System Rental Kit with Original DDORK1. User manuals are also available on the Dana Dolly website under Professional Video - Tripods, Supports & Rigs - Cine Dollies & Track Systems.